PPSC Jobs Today 2018 is listed below in our site. 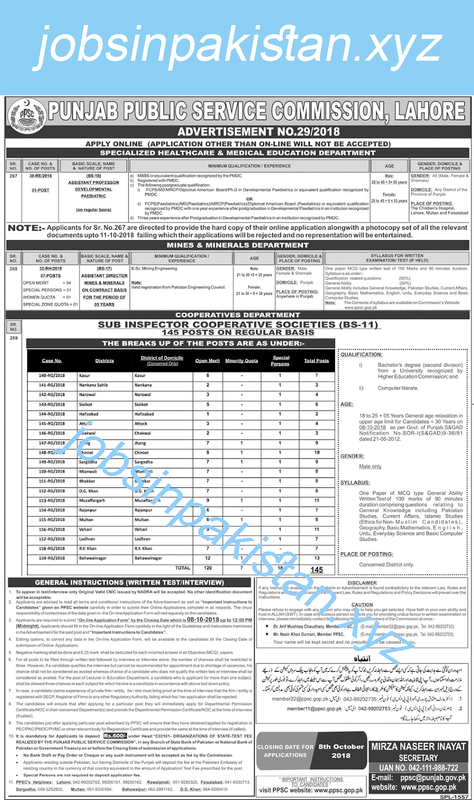 The PPSC Advertisement No 29/2018 for PPSC Jobs 2018 is come on today newspaper Jung. The last date for applying online for PPSC Jobs 2018 is 08 October 2018. Apply online for PPSC Jobs Today 2018 (Applications Other Than Online Cannot Be Accepted). The PPSC Jobs 2018 is listed below as per department name. Punjab Public Service Commission of Pakistan requires a applications for following empty jobs. Open merit list is divided into following cities of Punjab, Pakistan. Qualification: At Least Bachelor Degree (second division) from a University Recognized by HEC (Higher Education Commission) of Pakistan. Age: 18 to 25 + 05 Years general age relaxation as per Govt. of Punjab policy. Domicile: Any district of province of Punjab. Qualification: MBBS or equivalent recognized by PMDC.